The Trump administration on Friday sanctioned a Thai company found to be aiding an Iranian airline that is transporting terrorists and other aid to Syria on behalf of embattled President Bashar al-Assad. Sanctions have been placed on Thailand's My Aviation Company Limited for aiding Iran's Mahan Air carrier, a state-controlled entity that has been caught sending militants and cargo to Syria on a routine basis, according to the Treasury Department. The latest sanctions come amid a larger crackdown by the Trump administration on Iran's global terror and financial networks, actions that have crippled the Islamic Republic's economy and sparked popular protests against the ruling regime. Iran's Mahan Air has been a source of controversy for some time, with Congress repeatedly calling on the Trump administration to crack down on the air carrier for using commercial flights as a cover to transport militants and weapons to Syria. The sanctions are likely part of a larger effort by the Trump administration to thwart what it has described as an "imminent attack" on Syrian civilians by both Iran and Russia. "Mahan Air continues to fly into Syria every week, even as millions of innocent civilians in Idlib province are under threat of imminent attack from the murderous Assad regime and its backers in Iran and Russia," Treasury Secretary Steven T. Mnuchin said in a statement announcing the new sanctions. "Treasury is cutting off yet another service provider acting on behalf of Mahan Air, a sanctioned airline that transports soldiers and supplies to Assad and fuels terrorist activities across the region," Mnuchin said. "This Thailand-based company has disregarded numerous U.S. warnings, issued publicly and delivered bilaterally to the Thai government, to sever ties with Mahan Air." The new sanctions are meant to serve as "a warning that the U.S. is intent on ensuring that the aviation industry ceases providing services to, and profiting from, this terrorist-affiliated airline," according to Mnuchin. The Thai travel company is accused of "action for or on behalf of Mahan Air" as it organizes flights into Syria. "Since the onset of the Syrian civil war, Mahan Air has routinely flown fighters and materiel to Syria to prop up the Assad regime, which has contributed to mass atrocities in the country and the displacement of millions of innocent civilians," according to information provided by the Treasury Department. "Mahan Air continues to operate a regular schedule of three weekly flights to Syria, with additional flights periodically observed, totaling more than 170 flights since September 2017," according to the announcement. 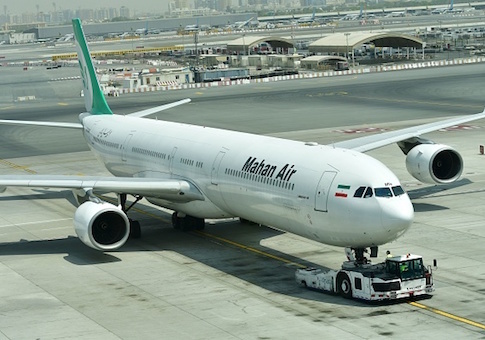 My Aviation, the latest company hit with sanctions, has helped Mahan organize freight bookings and has worked with various entities to ensure certain cargo makes it aboard Mahan flights into Tehran. Mahan Air was itself sanctioned in 2011 for aiding Iran's global terror networks. The state-controlled airline has provided "support to numerous terrorist groups" and "has transported IRGC-QF [Iranian Revolutionary Guards Corps] operatives, weapons, equipment, and funds abroad in support of the IRGC-QF's destabilizing regional operations," according to the Treasury Department. Additionally, "Mahan Air has routinely facilitated the movement of IRGC-QF personnel, fighters, and material, between Iran and Syria for military training, and has facilitated the movement of IRGC-QF members by bypassing normal security protocols and flight manifests." This entry was posted in National Security and tagged Iran, Sanctions. Bookmark the permalink.